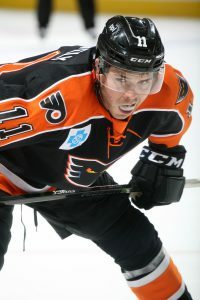 Lehigh Valley, Pa. – The Lehigh Valley Phantoms, proud AHL affiliate of the Philadelphia Flyers, announced today that they have loaned forward Steven Swavely to the Reading Royals of the ECHL. Swavely, 27, has played 40 games for the Phantoms this season, tallying seven points. Swavely originally signed a PTO with Lehigh Valley on December 19, 2018. He posted a career-best, three assists on December 22, 2018, in a 6-1 victory in Hershey that helped him earn a one-year AHL contract that he signed on January 2, 2019. Prior to signing with Lehigh Valley, Swavely had played 26 games this season for the Reading Royals (ECHL) and led the Royals with 28 points, 12 goals, and 16 assists at the time of his signing. He also ranked 15th in the ECHL in points and was coming off a 13-game points streak. He notched 20 points in his last 14 games for Reading. A native of Reading, Pa., Swavely is currently in his third full professional season after four years at the University of Maine. He has totaled 96 points on 43 goals and 53 assists in 104 games for the Reading Royals. 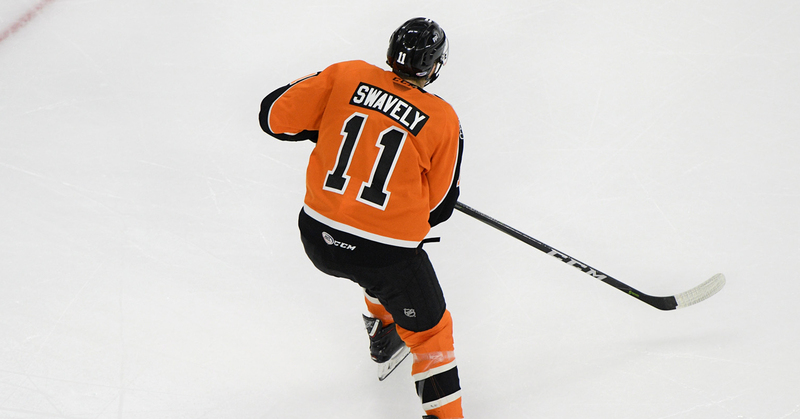 Swavely has played 93 games for the Lehigh Valley Phantoms during parts of the last four seasons.